Our home is not just a dwelling place. It should be a place of comfort, shelter, safety and warmth; a place to raise family, welcome friends, and a springboard for all our other daily activities. In short it is the main setting for our health throughout our lives. However not everyone has the best sort of home for health. At PHE we take housing as a public health issue very seriously. Research shows that one in five homes present a risk to health and wellbeing, particularly from excess cold and falls. The impact on physical health is clear, for example damp surroundings cause respiratory diseases or a broken stairwell can lead to trips and falls. But poor housing also has a serious bearing on mental health and wellbeing, particularly cold homes, unsuitable homes and overcrowded homes. New estimates show that poor housing is costing the NHS at least £1.4bn per year. We cannot ignore the role that housing plays in sustaining good health and keeping people out of hospital. Poor and unsafe housing can occur in all forms of home ownership and occupancy, but in general the private rented sector has the highest rates of poorer housing. PHE has developed a multi-stranded programme of work which sets out to reduce the impact of poor, unsuitable housing and homelessness on both physical as well as mental health and wellbeing. In turn this aims to reduce health inequalities, along with the associated demand for health care and social care. The programme supports local areas and housing organisations to contribute to intelligent and integrated local commissioning. Through this we want to develop the workforce to ‘make every contact count’ and contribute to PHE’s priorities. 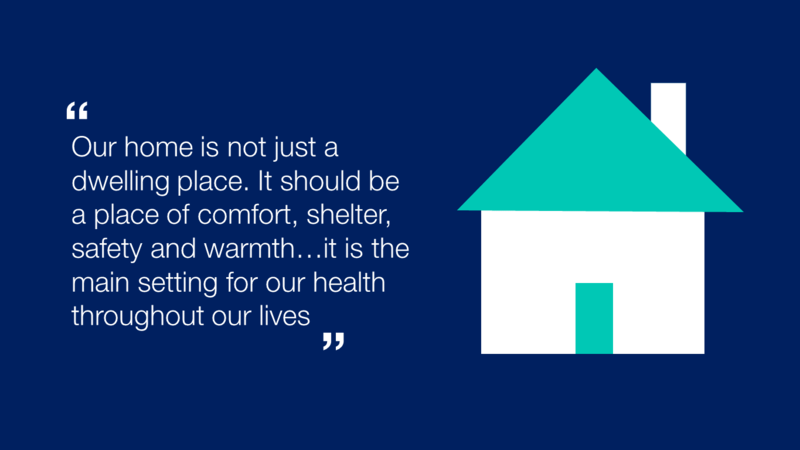 Bringing together health and housing is fundamental if we are to rise to the challenge to improve the nation's health. A housing and health resource developed by the Chartered Institute of Environmental Health. Based on an extensive literature review, and with input from expert Environmental Health Practitioners, the resource provides evidence, case studies and guidance to enhance local understanding of the relationship between the home environment and health. A suite of training resources, a study on the impact of the Housing Workforce on Health Outcomes, and case studies - developed by Sitra, the national membership organisation for housing with health, care and support - to enable housing providers to further develop their staff to become part of the wider public health workforce. Resources will equip staff to begin conversations with their customers about their health on topics such as smoking and harmful drinking, dementia, mental health and wellbeing. Standards and supporting guidance to develop the housing sector’s capability in generating evidence of ‘what works’ in improving health outcomes. Led by HACT, a housing solutions agency, a public consultation on the standards is launched today, with the final standards published later this year. Other projects within this programme of work include a recently published Health Needs audit Toolkit, helping local areas better understand the significant health inequalities experienced by people who are homeless; a new evidence review of the opportunities to prevent homelessness and ill health for example in the community health settings and suggestions for local action based on this, and a new series of resources to support local areas to commission home adaptations for improved health and wellbeing. Housing is fundamental to our health, and we have an opportunity to harness the resources, talents and energy from across health, social care and housing sectors to create homes that promote health at every stage of the life course. I hope that these materials and information will help local teams to reach out and join together to establish better health and wellbeing for people in their communities.